But, when it comes to honoring this NASCAR champion with graphic displays, Cincinnati-based ScottModels, Inc., has proven to be just as fast to the finish line. 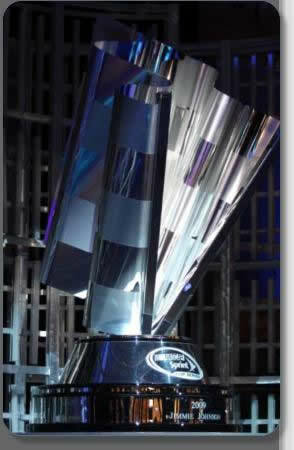 ScottModels has fabricated two 12-foot tall replicas of the Tiffany & Co.-designed 24-inch tall silver trophy awarded to Johnson as the series winner. Both replicas have been displayed as an onstage podium backdrop element each of the past two years at the NASCAR Sprint Cup Series Awards Ceremony, which most recently was held Dec. 3 at the Wynn Las Vegas Hotel. The first oversized replica has been given to Hendrick Motorsports (for which Johnson’s team drives) and displayed by Hendrick at its facility located near Charlotte, N.C. The second replica was created for NASCAR and Sprint for display at the 2010 awards presentation and then stored for future presentations. For both trophy displays, Scott Models chose Alucobond® aluminum composite material (ACM), the heavy-duty architectural cousin of Dibond® graphic display board for construction of the trophy’s flags. Alucobond ACM consists of two sheets of 0.020” aluminum thermobonded to a plastic core. Alucobond provides extraordinary flatness and rigidity, excellent formability, low weight and outstanding weather resistance. Alucobond is approximately one half the weight of aluminum. It can be routed and returned to add dimension or roll-formed to deliver sweeping curves. Instead, Scott Models utilized a 192-inch by 60-inch Alucobond sheet in the 4mm thickness and Bone White Color with the smooth surface on both sides of the panel to create two 7-foot tall waving finish-line flags, which topped the replica’s rolled steel base. The flags consisted of three Alucobond pieces covered with mirrored polycarbonate film to create a checkered-flag pattern effect and fastened together with epoxy and an aluminum spline. The flags were attached with hooks to flag poles bent from sheet metal. Each flag and its pole weighed approximately 150 pounds. The completed display in its entirety weighed an estimated 700 to 900 pounds. Scott Models worked with the actual Tiffany trophy to produce a three-dimensional model in a computer-aided design (CAD) program to determine radius and tangent markers. Each flag included 18 radiuses. For more information about Alucobond, visit www.alucobondusa.com. To view additional photos of the model making in progress, visit ScottModels online at http://www.scottmodels.com/nascar.html. For more photos of the 2010 NASCAR Sprint Cup Series awards banquet, visit NASCAR at http://galleries.nascar.com/gallery/Cup_Series_Awards_Ceremony.